Gail sees the car that caused Daphne's accident in Lassiters Car Park. Jane locks up the office as Charlene appears behind her and makes her jump. They make their way over the bridge and towards the car park at the back of the hotel during this scene. Charlene asks how her day was. She says Tony has asked her out to a dancing competition. Charlene heard Tony's end of the conversation and says that she was encouraging him. When Jane exclaims surprise at this, Charlene says he only wants to go dancing. JANE: Shows how much you know, latin lovers are legendary. CHARLENE (mocking): Oh, are they? Jane says she's not sure about going dancing with Mike away. Charlene says she can always sit at home and knit with her nan instead. Just then Gail runs around the corner from the car park. She stops briefly to tell them that she's seen the car that caused Daphne's accident and she's off to find Paul to keep an eye on it while she calls the police. Jane says that must mean the guy who was driving the car must be around somewhere. Charlene suggests they go take a look, as Gail runs into The Waterhole pub. JANE: Are you sure this is a good idea? CHARLENE: I'm a Ramsay, we don't think of things like that. In the car park, they discover the car still has a huge dent in the side. Examining the paintwork, Charlene identifies scratches the same colour as Daphne's car. Jane suggests they let the tyres down, but Charlene says that will take too long. Just as Charlene is forming a plan, the driver and his friend arrive behind them. Charlene covers by saying that the garage has got them going round giving out free quotes to drum up business with really good discounts. “Especially to spunky guys” She gives them her business card and says that if they bring the car in and ask for her, she'll give them a $100 discount. The guys are surprised that Charlene and Jane are panel beaters. Jane says Charlene does most of the work, Charlene says Jane's a model. Paul and Jim run out of The Waterhole, telling Gail to call the police. The guys decide that they're not interested in meeting the girls, and start to put their beer in the boot of the car to leave. The guys get out the keys to the car, and Charlene feigns an interest in the key ring to take the keys off the guys. Jane closes the gap so that they can't see. Charlene shouts ‘Run' and they run with the keys. As the guys give chase, Jim and Paul arrive and they give Jim the keys. GUY: I'd give those keys back if I were you. JIM: If you want them, you'd better come and get them. The driver tries to take the keys back, but Jim snatches them away and blocks his hand. He punches Jim with his other hand, who's knocked to the ground. The key flies out of his hand. As the driver makes aim for the key, Jane picks it up, and Jim grabs his legs, forcing him to fall. The other guy wrestles with Paul. Charlene jumps on his back, giving Paul time to recover. As both fights continue Charlene tells Jane ‘Don't just stand there, lay the boot in'. Gail finds Tony outside the office, and drags him along. Jane is too nervous to put the boot in. As they guy who has been fighting Jim recovers and gives chase, Jane runs into Gail and Tony coming the other way. Tony wrestles him to the ground, and Jane gingerly kicks him in the knee. Jane gives the keys to Gail. CHARLENE: (Who has her guy hog tied) Hey boss, I promised this guy $100 discount, is that alright? Jim laughs as we hear the police arrive, and Paul and Charlene continue to hog tie one of the men. 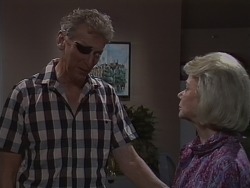 Beverly cleans up Jim's wounds, while Paul says Jim pushed his luck. Todd and Katie are impressed with the fighting, although Todd is only sorry he missed it. They want Paul to tell more of the heroics, but Jim says there's nothing glamorous about fighting. Todd says it's not like when their parents used to fight. This is bad guys against good guys ‘like Luke Skywalker and Darth Vader' says Katie. Jim and Bev tell them this isn't like TV or the movies. Gail says it's a fight they couldn't walk away from. Sure, there were good guys and bad guys, but it all started because someone really did get hurt. Frank D'arcy comes in, and Helen tries to introduce him, but he says they've already met. Eileen says he's a lovely bloke, which Frank humorously agrees with. Frank says that Daphne has a lot of courage. Des says that they will have to come over for dinner one night ‘when Daphne gets better'. Frank says thanks, but he's heading back up north tomorrow' This appears to be a surprise to Helen, or perhaps she's just upset. Katie shows concern for ‘Uncle Jim' Todd finishes his homework and Beverly finishes making dinner. ‘Steak and Salad'. ‘What else….only joking' Beverly wants to say something. Todd says if it's about them disappearing with Scott, then they're sorry'. Beverly says what she wants to say is she's sorry for flying off the handle. Todd and Katie aren't bothered, which surprises Beverly. Todd and Katie say they realise that it's because she cares about them. Their own parents were so busy fighting, they didn't care what they where up to or where they where most of the time. Outside Daphne's room, Paul and Gail fill Des in on catching the guys. Des says he's just relieved to know the mongrels are behind bars. Paul tells him that they're not sure about that. Gail says they stood a fair chance of getting bailed. DES: Why should they get bail? My wife is in there, now tell me why should those mongrels get bail?. Paul says they've received 4 charges: 3 for driving and for failing to stop and render assistance. Des begins shouting, and Eileen comes out of the room with Jamie telling him to quieten down as there are sick people around. DES: There's a few more sick people out on our streets thanks to our fantastic legal system. Paul and Gail calm him, saying that they still have to go to court, and bail won't affect the penalty. Des apologises, Paul says they were pretty shocked themselves when they heard. Des thanks them for their help in getting them arrested in the first place. Paul and Gail go to leave, and Eileen asks for a lift, deciding that she can't convince Des to come home. DES: “I'll take Jamie to say goodbye to Daphne”. Gail and Eileen go to the car, and Paul watches from the door as Des takes Jamie to say goodbye to Daphne. He lets Jamie's hand touch her lips and tells him that she'll be home soon. Outside Paul takes Jamie, and tells Des that he admires the way he's handling it all. Des says that he's trying to convince himself as much as anyone else. DES: Fact is, if Daph doesn't wake up soon, I'm just going to fall apart at the seams. She's just packing death. Time just seems to be running out for us. Paul pats him on the shoulder and leaves. Helen and Frank finish dinner and he asks her if she's coming back to the Bungle-Bungles with him. She says she'd miss her family and friends too much, being a townie. But it's the most difficult decision she's ever had to make. Frank understands, he's a country person and could never live in the city. Now, stand by for what this summariser calls the worst line in Neighbours history. Ever. HELEN: I always thought that was something like soaking up an ocean of tears with a very thin tissue of logic. Helen cries in Frank's arms. A nurse comes in with a breakfast tray for Des, who's fallen asleep in the chair next to the bed. He kisses Daphne and opens the blinds. DES: Today is going to be the day that you wake up, I can feel it in my bones. The camera starts directly above the bed, and swoops down to face Des, who's holding Daphne's hand and looking at her, stroking her face. DES: Come on Daph, you can't lie here forever. So many things we have to do, so many things we haven't done yet. Can't you understand me……..can't you hear me? I love you. Her index finger moves. Des looks at her hand in his. He looks at her face. Her hand moves again. Again, he looks at her hand, then looks at her face. Her mouth begins to move. DAPHNE: I love you too, Clarkey. He jumps up, knocking the trolley with the breakfast tray on, and runs out of the room. Down the corridor, he finds a nurse, who asks what's wrong. Dragging her into the room, he says ‘Nothing's wrong, it's my wife, she's coming out of her coma'. As Beverly comes along, he picks her up and swings her round in celebration. Just then the machine makes one long noise. Daphne has gone into cardiac arrest. BEVERLY: Put me down, Des. 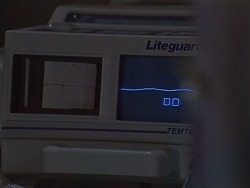 She runs into the room, as the other nurse gets out the defibrillators and they both begin to apply them. Des struggles to take in what's happening. They apply pressure a couple of times, but the machine is flatlining. BEVERLY: I'm sorry Des, it's not going to do any good. They turn off the machine. 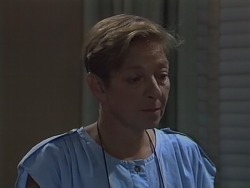 Des moves towards the bed and picks up Daphne's lifeless corpse. DES: But she just spoke to me……Awww no…..awww no…….no Daph…noooooo. Daph….no….